Hillary Rodham Clinton signs copies of her new book at a store in New York. HILLARY CLINTON HAS refused to rule out challenging the result of last year’s presidential election if Russian involvement is shown. Speaking to NPR’s Fresh Air programme, Clinton was asked about the stance of her Democratic Party in alleging Russian involvement but not challenging the result. Clinton said there was no provision in the US constitution to challenge the result using legal means, but said it was valid to “raise questions” about the result. She was then pushed by interviewer Terry Gross about whether she could still challenge the result. Gross: You’re not going to rule it out. Asked what these means would be, Clinton seemed unsure. “Basically I don’t believe there are. There are scholars, academics, who have arguments that it would be, but I don’t think they’re on strong ground. But people are making those arguments. I just don’t think we have a mechanism,” she said, before mentioning that elections have been overturned in other countries. As CNN points out, any such challenge would likely have to show that collusion with Russia not only took place, but also changed votes. Email “Hillary Clinton isn't ruling out challenging the 2016 election result ”. 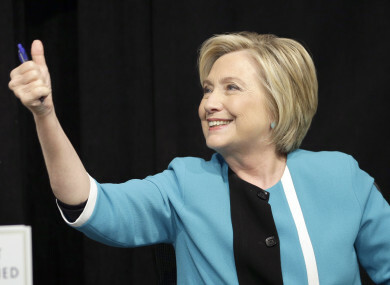 Feedback on “Hillary Clinton isn't ruling out challenging the 2016 election result ”.